Your Source For Ski Resort Deals. Ski vacation packages to Eastern Canada. Take advantage of our deals, discounts, the best planning advice, or create your own ski / snowboard package. Mont-Sainte-Anne, located in beautiful Quebec, Canada, offers pure snowy bliss. The air is pure and the skiing and snowboarding conditions are just right at Mont-Sainte-Anne. Snow conditions are always exceptional, thanks to a high performance snowmaking system, with high technology snow groomers. Mont-Sainte-Anne will keep you coming back for great outdoor snow fun! Create custom Mt Ste Anne ski vacations online, 24/7, using our interactive website. Simply choose your start and end dates, # of adults and children and click Create A Quote in the Trip Quote box above! Bundle and Save! Our ski vacation packages to Mt Ste Anne, QC with exclusive discounts are backed by the best service in the industry. View our wide selection of lodging options, trail maps & webcams, snow reports, ski school information, dining, activities & shopping, and maps! 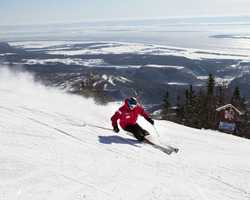 Mt Ste Anne Ski Resort Packages & Deals - Save up to 50% Need Help? Call Toll-Free, 877-4-SKI-EAST, to talk to a Ski & Snowboard Vacation Specialist today!